William j. Barry was born in Newton, New Jersey. He moved to Florida and then to Georgia at a young age. Ever since grade school, William enjoyed penning original short stories. They were a good outlet for his overactive imagination. William grew up in the Augusta, Georgia area before moving to Athens, Georgia where he obtained a bachelor’s degree in psychology from The University of Georgia. After college, William returned his focus to writing. Sebastian and the Afterlife was his first novel. The book was signed by TWCS Publishing House and released in February of 2011. 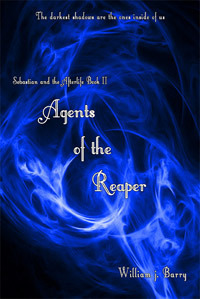 He followed that book with Agents of the Reaper, the second installment in the Sebastian and the Afterlife middle-grades/teen fantasy novels. It was released February 9th, 2012. Besides writing, the author also enjoys writing and recording music and filmmaking. William is married and currently lives on the outskirts of Athens, Georgia.